Rockman ZX Advent (ロックマンゼクスアドベント, Rokkuman Zekusu Adobento?) 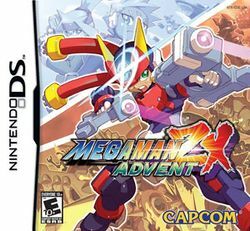 was localized outside Japan as Mega Man ZX Advent. It is the second installment of the Mega Man ZX series of Mega Man video games. Taking place a few years after the first ZX, the game follows two new protagonists as they battle with various enemy Mega Men, the infamous Model W, and their own destinies. The title plays very similarly to its predecessor with a multitude of expansions, including twice as many playable forms. Also different from its predecessor is the English localization which now includes a full English voice cast. The game was first released in Japan on July 12, 2007. The North American version was released on October 23, 2007. The European version was released in 2008. This page was last edited on 27 November 2017, at 13:22. This page has been accessed 16,518 times.